To its 33,000 residents, Bayview Hunters Point, the southeast corner of San Francisco, is the city’s best neighborhood; our climate the sunniest, our views the most spectacular. Big developers see these attributes, too, and the struggle for control of this jewel of a neighborhood in the most visited city with the most valuable real estate on earth has been joined. With much of what little land in San Francisco remains to be developed, Bayview Hunters Point is a developer’s dream. 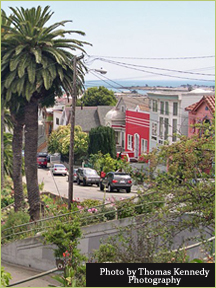 While local builders dream of renovation and rebuilding projects that will put our people to work, some of the nation’s largest developers dream of “repeopling” this 91 percent community of color and uprooting our deeply rooted and interconnected people who, with meager resources, have attained the highest rate of homeownership in San Francisco. And those big developers are using their financial clout and political connections to implement their dreams. Our journalistic challenge at the Bay View is to cover this epic struggle, reflective of and instructive to other inner city neighborhoods where those who fled decades ago now want to return, and to advocate for justice. Distribution by Neighborhood: Bayview District, Hunters Point, Visitacion Valley, Potrero Hill and OMI.